This violin from 1987 was inspired by the circle of Giuseppe Guarneri filius Andrea, c. 1730. Included in this “Circle of Filius,” as we interpret it, is Giuseppe’s son, the young ‘del Gesu,’ as well as Carlo Bergonzi and even Pietro Guarneri on his return visits home from nearby Venice. We worked freely with Cremonese building methods, using materials and varnish similar to those of the period, and found that working in this manner is an expressive playground. Instead of rigidly copying a specific maker, it’s pleasant to let go and broaden your inspiration with related ideas. The happy result is recognizable without being specifically identifiable, and many of our violas and cellos made since are in this vein, starting in this circle. The back is from two pieces of quartered Bosnian maple with the flames descending from the center joint. The ribs with a more vertical flame are similar, while the top is Italian spruce with a medium grain becoming broader towards the flanks. The slab-cut scroll is brutish, even forceful, which is an impression duplicated with masculine edging throughout. The varnish is textured and of a deep orange color and the whole is antiqued. 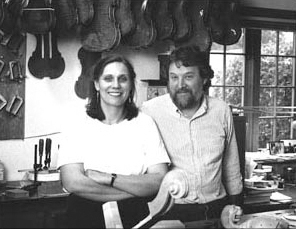 Joseph Grubaugh & Sigrun Seifert met in Los Angeles in 1977 where they learned restoration and making in the style of Simone F. Sacconi by way of Hans Weisshaar. They made their first joint instrument in 1982 and have since won five gold and four silver medals at VSA International Competitions. They work in Petaluma, California, north of the Golden Gate bridge, where they complement new making with high-end restoration. In 1994 Joseph and Sigrun discovered the ‘Duke of Alcantara’ Strad which had been missing from UCLA for 27 years and were instrumental in the violin’s return. *Please contact Carlos Tome at ctome@tarisio.com or complete the form below for additional information about this lot.